These fine, handcrafted wallets are made by our son, Jacob Leahy, in his shop in Alaska and are made from a rustic full grain leather. All scars and natural defects add character to leather. Designed and built to last a lifetime. Jake builds all his products with the rugged Alaska climate in mind, so you can be sure of the high quality in everything that goes out the door. Sewn in the shop with waxed polyester thread. 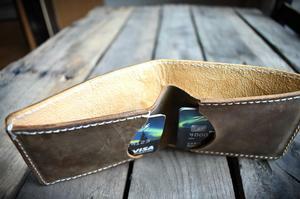 Two card pockets can hold up to five cards a piece. Over time, as the leather breaks in, you might be able to fit even more. 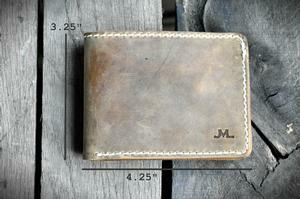 Full grain leather is the only option for JML Leatherworks. This is the best type of leather money can buy, and it's for good reason. All of the markings from the steer's life show up in the wallet you receive. Brands, bug bites, brushes against other members of the herd, and marks from barbed wire fences all come through in the finished product. This wallet comes in all three of our color choices: Tan, Black and Oxblood and are branded with simplyrugged.com.